Home / Baby Acne / What to do when your baby develops a facial rash? What to do when your baby develops a facial rash? It is inevitable- your baby is going to have some type of facial rash. 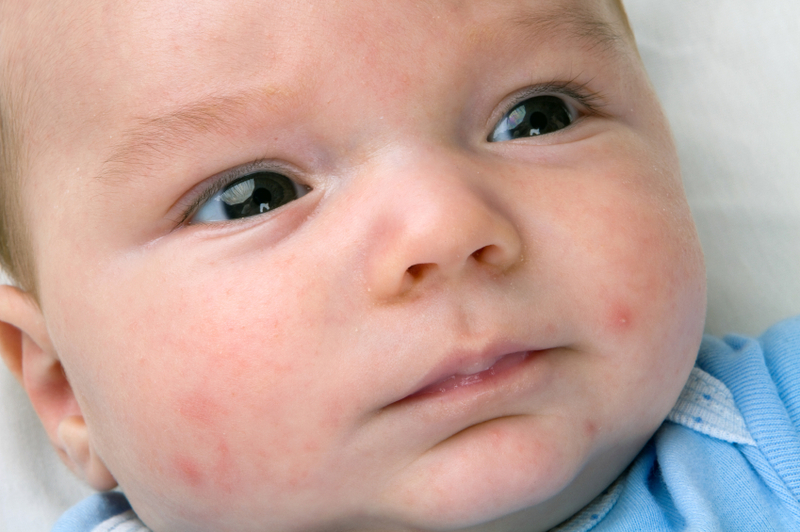 But, with all of the different types and causes of facial rashes, how do you decide which one your baby has? 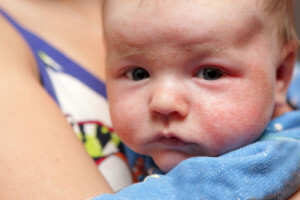 Here, we discuss several common baby facial rashes so that you can decide which one your baby has and learn what to do when your baby develops a facial rash. Most babies will experience a case of baby acne within the first 2 months. It occurs most commonly on the face and appears as red papules and pustules, like teenager acne. Lingering maternal hormones along with sebaceous oil and bacteria are thought to be the culprits of these baby acne flare-ups. It is important to know that these flare-ups bother us parents more than our babies, so don’t worry if you see it appearing on your precious baby’s face. A baby acne episode usually lasts for 2 to 4 weeks and resolves on its own. Continue to gently wash your baby’s face with a gentle soap. If you need the acne flare to be soothed quickly for a photo op, over the counter (OTC) 1% hydrocortisone can be used twice daily for 1 to 2 days. Individuals with eczema have sensitive skin that, when it gets too irritated or dry, can result in red, rashy skin. Rashy eczema patches appear as ill-defined erythematous, dry patches of skin. These areas are typically itchy and the skin will be damaged from your baby or child scratching at the areas. Eczema typically affects different body areas based on age. From 1 month old to 2 years old, eczema most commonly afflicts baby’s cheeks and the extensor (outer) sides of the arms and legs. If you see this affecting your baby’s cheeks or arms and legs, start soothing it immediately with a heavy-duty moisturizing ointment. Because of teething, babies begin to drool starting at 2 to 3 months old. As baby eczema commonly affects the cheeks, the extra drool can further exacerbate the eczema. If using a moisturizing ointment isn’t enough to soothe the eczema flare, OTC 1% hydrocortisone cream can be used twice daily for 2 to 3 days to soothe the flare. Contact your pediatrician or dermatologist if the eczema flare is not better in 3 days. Cradle cap, or seborrheic dermatitis, is a common baby skin condition that most frequently presents itself within the first 3 months of baby’s life. It is a flaky skin rash that bothers us parents more than our babies. Although it may appear to cause discomfort, cradle cap tends to not cause any irritation or itchiness to our babies. The adult comparison to cradle cap is dandruff, and typical areas affected are the scalp, eyebrows, around the nose and behind the ears. 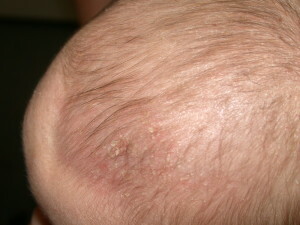 The cradle cap rash forms when there is excess oil and skin build-up as well as an overgrowth of yeast-like Malassezia furfur (normal skin inhabitant). Cradle cap is not contagious- some babies are just more prone to it. Using a soft bristle brush during bathtime along with a gentle 2-in-1 hair and body cleanser can help prevent and treat a case of cradle cap by helping to exfoliate away the buildup of excess oil and skin. Fifth disease is a viral rash that affects children between 3 and 10 years old. It is caused by the virus, Parvovirus B19. Associated symptoms include fever, headaches, achiness, and stomach aches. A bright rash usually appears on the cheeks giving a “slapped cheek” appearance. In older individuals, the rash may also present as a lacy-like rash affecting the arms, legs, chest and back. Treatment includes OTC 1% hydrocortisone cream twice daily to calm the rash. Special consideration is given to immunosuppressed children, children with sickle cell anemia and pregnant women with unknown exposure to parvovirus. All of these individuals should seek attention by a doctor if there is known exposure to parvovirus. Hand, foot and mouth typically affects children 1 to 4 years old. It commonly occurs in the summer to early fall. It is usually caused by enteroviruses, specifically coxsackie virus. The rash appears as blister-like lesions in the mouth, specifically the throat, tongue, inside cheeks, gums, and hard palate. Juicy red bumps can also appear on the palms and soles and a general rash may also appear on the trunk and buttocks. As for treatment, OTC 1% hydrocortisone cream can be used to calm the rash. Fever is usually associated with this rash, which can be managed with age-appropriate doses of acetaminophen and ibuprofen. Aspirin should not be given to any viral rash including Hand, foot, and mouth disease as Reye’s syndrome may present. Reye’s syndrome can lead to liver failure and even death. Because of the pain from the blisters, children may lose their appetite and not eat or drink. Push fluids as much as possible with icy treats like popsicles and fluids with added elecetrolytes like Pedialyte. If your child refuses to eat or drink, seek attention from a doctor as the doctor may be able to prescribe something to help with the pain. If your child becomes dehydrated and lethargic, take your child to the doctor or even the emergency room.